Elephant Cross Stitch Pattern available for instant download via Etsy. This pattern is in PDF format and consists of an example photo, a floss list, and a color symbol chart. You can see a small sample of the color symbol chart in the last photo. General instructions on how to make the item as shown will also be provided. In order to view and print the files, you will need a PDF reader which you can download free at http://get.adobe.com/reader/. 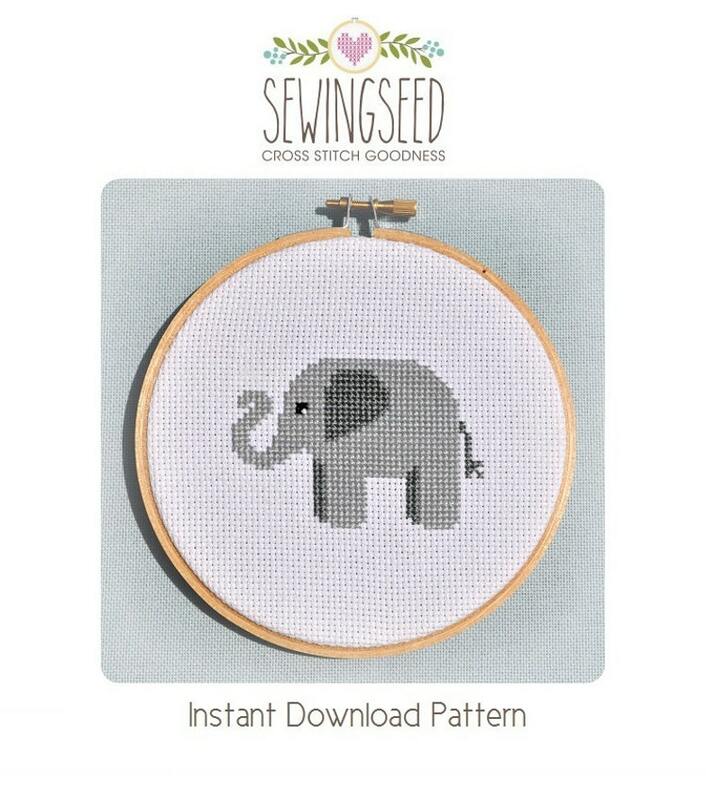 Due to the electronic nature of the pattern, no refunds can be given after the file has been downloaded. The pattern has been tested by me and you can see the results of that test in the first photo. This will give you an idea of what your finished project might look like. If you have any questions about this pattern, please ask before ordering. BEAUTIFUL design, colors, and chart! I will definitely be back! Thanks so much for the quick deliver, too! Easy to follow and great for beginners (I used colors I had on hand). This item is exactly as described and looks just the picture when completed. This was my second item I've ever cross-stitched. It's easy enough for a beginner. The pattern was easy to read and presented well. I presented this as a gift to my niece accompanies with a giant sloth stuffed animal. She loved it! Your files will be available to download once payment is confirmed. Here's how. Coupon Codes must be redeemed during the checkout process. Kits can be returned for a refund within 14 days of the delivery date ONLY if the kit materials are unused and in original condition. If your order was a Christmas gift placed in the month of December and you would like to return or exchange, please contact me before January 3rd. The original shipping charge is not refundable. You must first contact me within 7 days of delivery for authorization (RMA#) prior to any return. Items returned without authorization are not eligible for a refund and they will not be returned. You are responsible for the return postage unless the fault lies with me. In the unlikely event your kit arrives damaged, please contact me for a replacement. Thank you! My listings are clearly marked as patterns, so please be sure of your purchase before you commit to buy. If you have questions about the pattern, please ask before you order. My PDF patterns have been tested and you should not experience any problems opening them; however, if you do not have the appropriate program or system requirements for Adobe, please let me know and I will help you troubleshoot the problem. If you are still unable to open the PDF after we have exhausted all efforts to fix the problem, I will mail you a printed copy of the pattern. If you made a mistake in ordering, contact me as soon as possible. Refunds can be given if my records indicate you have not downloaded the pattern. Once my records indicate the pattern has been downloaded, the window for refunds has closed. If you experience the unfortunate event of losing your PDF Pattern after a computer crash, you can contact me for a duplicate PDF Pattern. Please send me a message along with your invoice number and I will resend your PDF pattern to the e-mail associated with the invoice. US customers - All packages are sent with tracking. If it has been 14 days since your order shipped and it has not yet been received, please let me know so that I can investigate the package whereabouts with the USPS. If it appears the package has been lost, I will send a replacement. International customers - Because of customs delays, it is possible that your package can be delayed as much as 60 days, however; if your package has not been delivered by the 44th calendar day after shipping (before the Paypal protection window closes), please contact me for a replacement or refund. If you would like an item in my shop completed for you, please contact me for pricing. You can also contact me with any other needs or questions you may have. All patterns copyright 2009-2015 and are for your personal use only. You are not authorized to share, reproduce, distribute, or sell any of my patterns. You are not allowed to print my patterns and include them in your own kit for distribution.